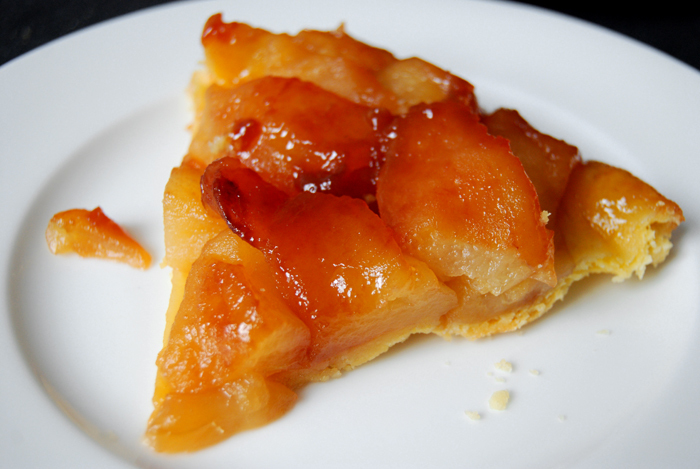 Tarte Tatin, I know so many people who call this their favourite dessert! Buttery apples fried with lots of sugar until golden brown and caramelised, topped with a crisp shortcrust baked in the oven. It’s like a traditional pie, just upside down! There is something very French about it and it’s not just the amount of butter and sugar, or its origin. Legend has it that this tarte was first created accidentally by Caroline Tatin. She ran the Hotel Tatin in Lamotte-Beuvron together with her sister Stéphanie. A stressful kitchen moment made her forget about the apples on her cooker, they caramelised and Caroline had an idea. 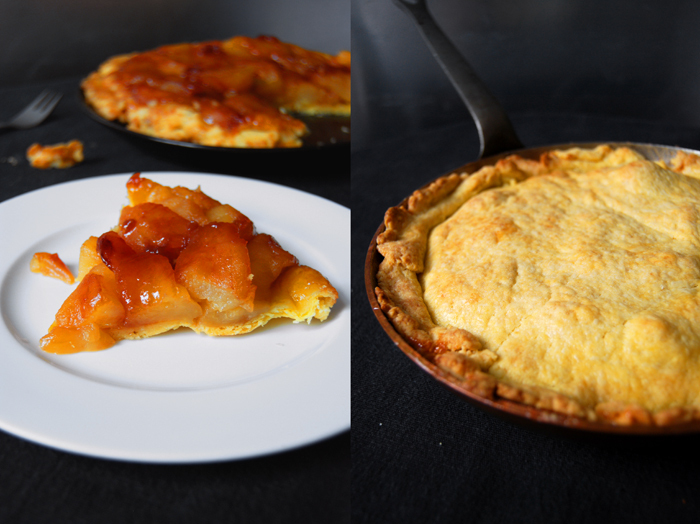 She left them in the pan, put the dough on top and baked the first delicious Tarte Tatin ever. The guests in her hotel were impressed and her signature dish was born! 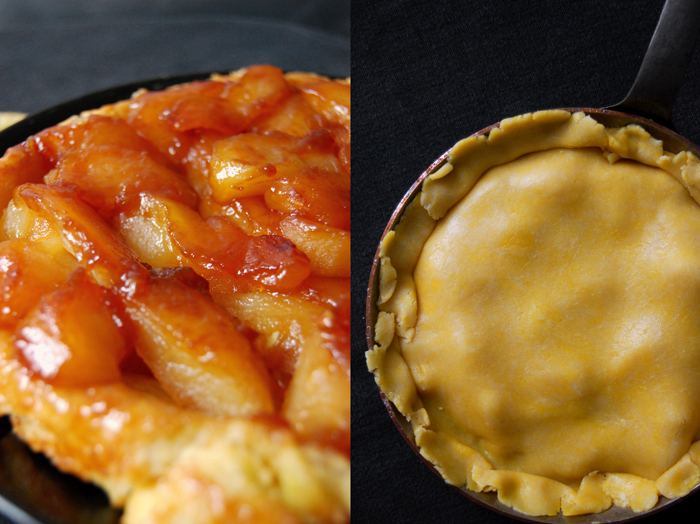 Now, there are many different ways to bake a Tarte Tatin. I make mine like my mother, with a crisp and buttery shortcrust (it’s the one I also use for my Sandwich Cookies). I cut the apples in eight slices each so that they can caramelise evenly on all sides (I find it easier than quarters). I fry them in plenty of butter and sugar, the apples soak up all the syrup and the base stays crisp. For the shortcrust, combine the flour with the sugar and salt. Cut the butter with a knife into the flour until there are just little pieces of butter left. Continue with your fingers and quickly work the butter into the flour until combined. Add the egg yolk and the water, continue mixing with the hooks of your mixer until you have a crumbly mixture. Form a disc, wrap in cling film and put in the freezer for 10 minutes. 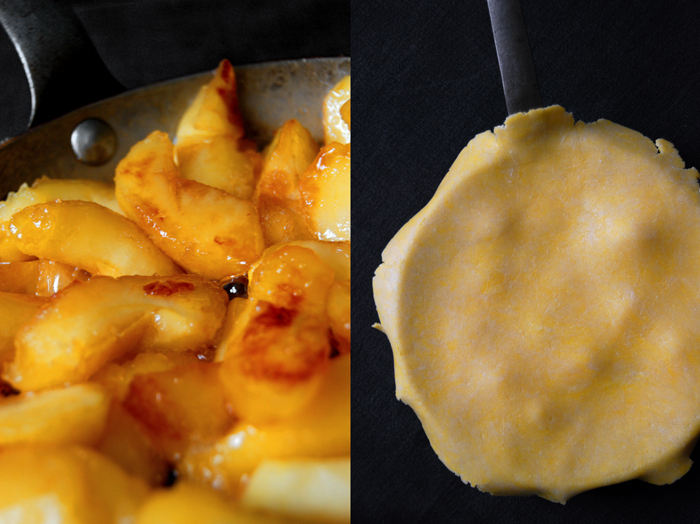 In a pan (or Tarte Tatin dish), melt the butter together with the sugar and the apples on high temperature. Let the apples caramelise, watch them and turn gently, mine needed 10 minutes. Roll out the dough, big enough to cover the pan and lay on top of the apples tucking the edges down the sides. Bake in the oven for 15 minutes or until golden brown. When the tarte is done, place a large heat resistant plate on top and turn the pan carefully upside down, keep in mind that it’s very hot! You can serve the warm Tarte Tatin with whipped cream or vanilla ice cream. Meike, another winner! I absolutely love any variation of apple pie/tart. I HAVE to make it soon. Thanks for sharing this recipe! I will let you know how it turns out for me. 🙂 Please, tell me how it worked out! I love this recipe! 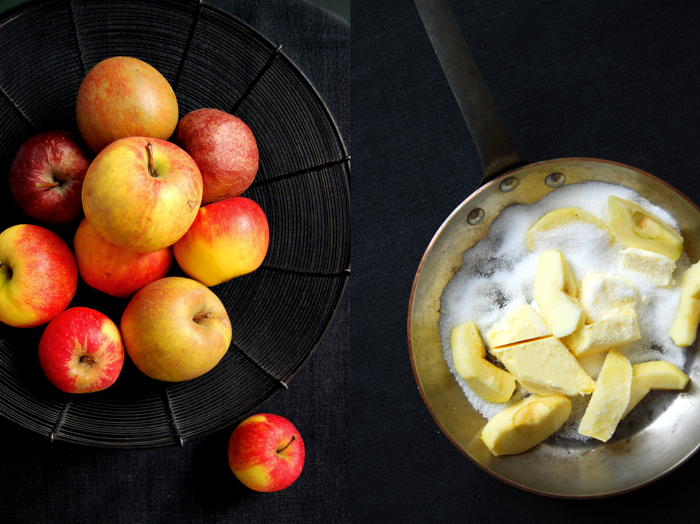 The dough is thin and stays crisp and the apples are so sweet, buttery and juicy!! My husband’s very favorite dessert! Beautiful photos, Meike. It’s my boyfriend’s favourite, too!